Touchscreen gadgets might be everywhere these days (check your pocket), and certainly they are incredibly handy, but nothing beats the convenience - and typing speed - of a physical keyboard. But as we toil away on our computers, tablets and phones simultaneously, you might find yourself having to decide which gadget gets the keys. Until now. Logitech have stepped up the convenience quota with the K480 Multidevice Bluetooth Keyboard. Forgive the name (we would have preferred 'the Logitech Knob-board') but the K480 is one of those rare items we get sent to test that we suddenly can't live without. 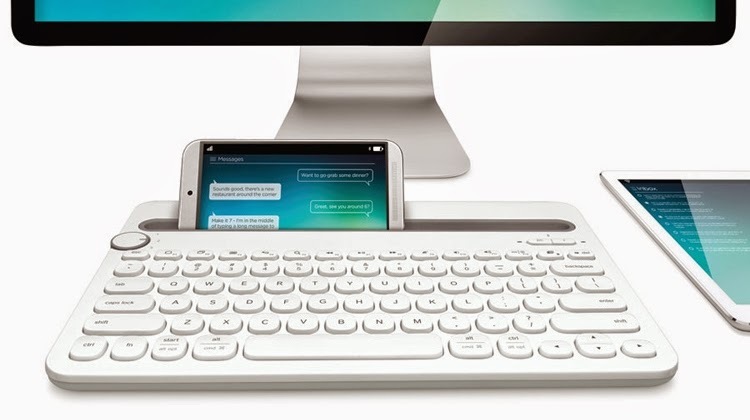 Yes, it might just sound like a boring, run-of-the-mill bluetooth keyboard, but this thing is so much more (he gleefully typed while using it). The magic comes not from a gorgeous key layout, nor from a thin profile, but from the turn knob that allows you to instantly switch keyboard control between three separate devices. Think about that. You're at your desk, working away on your desktop computer, when you suddenly get a personal email that pops up on the screen of your iPad. You want to reply, so pick it up, open the email app and start typing on the touchscreen keyboard. You then get a text on your phone, and again you want to immediately reply. So you pick it up, in your hand, and fiddle away at the small on-screen keyboard. Then you set it down and continue working. Effort. With the Logitech K480 Multidevice Bluetooth Keyboard changing from your computer to your tablet (and then your phone) requires nothing more complex than the twist of a switch. The keyboard then automatically connects to the device (so long as it has been previously paired) and away you type. 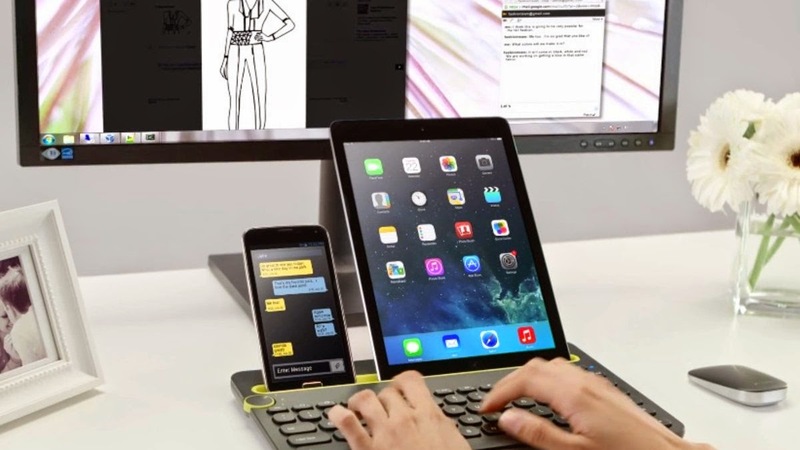 This eliminates the need for other Bluetooth keyboards, and also the need to pick up the mobile device to use the on-screen keyboard. In fact you can do away with the keyboard to your desktop computer as well - this can handle them all. The convenience of the K480 goes further than just connectivity though, as the recessed and rubberised cut-out beyond the keys is perfect for slotting in any number of gadgets. It will fit most normal sized tablets, in both portrait and landscape, as well as pretty much every phone we tried it with. It is also wide enough to have both a tablet (in portrait) and a phone in there at the same time, and still leave enough clearance for you to be able to peer over the top at your desktop computer monitor. 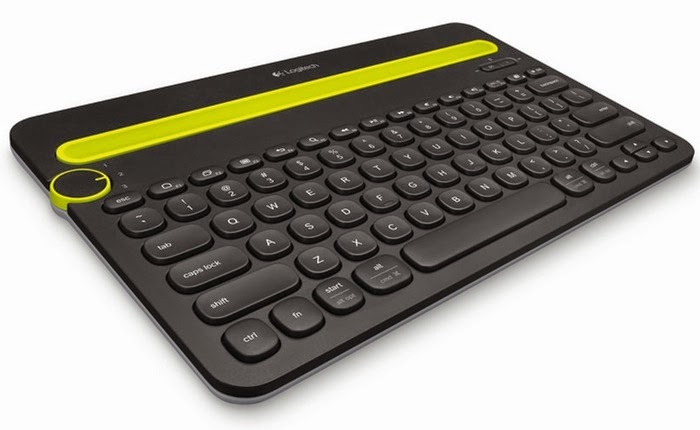 (but, from what we can tell - and aren't really surprised about, not Windows Phone) pairing the Logitech K480 Multidevice Bluetooth Keyboard is quick and simple, and once the device is paired and assigned either of the three knob (tee hee) positions, you're laughing. After that, the two AAA batteries will keep it running for a good long while, and certainly during our fairly intensive testing period we very never had any issues with either power loss or connection drop-off. Typing is also a pleasure as the keyboard itself is actually pretty robust and solid. It is much thicker than other Bluetooth keyboards we've tried (especially this super thin one) but the chunkiness only adds to the apparent value. It does not bend under the thunder of our chubby fingers, and the reassuring weight means you know that your Galaxy Tab 10 won't fall over backwards into your latte. Although it is portable, as you assume a wireless keyboard would be, it seems that Logitech are keen to point out that the K480 should also be considered an indoors animal; one more comfortable on your desk. At the end of the day the Logitech K480 Multidevice Bluetooth Keyboard has become a prized possession at Test Pit Towers, one used, enjoyed and required by all who stumble across it. All keyboards should be like this.